Is NBC trying to rid itself of Matt Lauer? Well, many people who are upset about Curry’s departure, blame Lauer. They say the two did not get along. Lauer has refuted this and others have said he tried to slow or prevent the train wreck that was that. 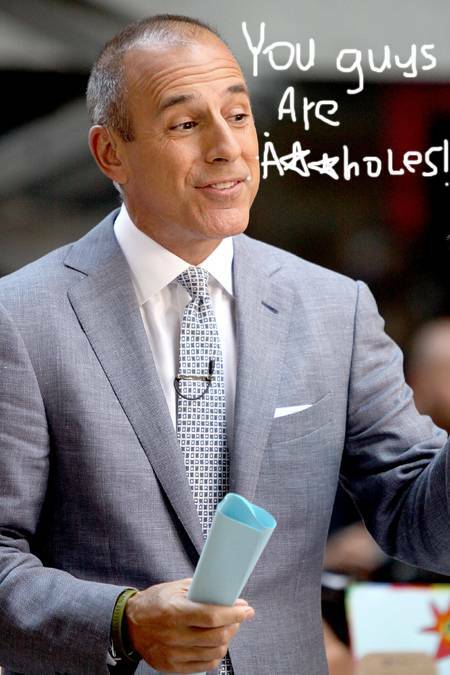 So, why do people say NBC is trying to get a divorce from Lauer? Well, there’s that recent interview with Jerry Sandusky that was another train wreck. Apparently, Lauer opposed doing it but went along to be a “team player” and thinks his producers set him up. Read that here. And there are reports that NBC has been seeking out new talent such as Anderson Cooper, who confirmed this but told NBC he wasn’t interested. Good for you Anderson, good for you. (Unrelated tidbit: I once showed my mom a photo of Cooper when he was a small child from his book and her response was “I remember taking that photo, that’s you in Golden Gate Park.” No, mom, it’s Anderson Cooper, her “Are you sure?” Yeah, mom, pretty sure he used photos of himself in his autobiography.) Media experts — such as the ones on yesterday’s Reliable Sources (best Sunday show), said while it is common for networks to talk to different talent, the situation at NBC is more serious. Rather than look to other networks for talent, look to the people you have already. Geist would make an awesome host of any show and brings more talent than you currently feature but you are the people who forced Curry out and think Jay Leno is funny (I know his ratings are high and when my artists went on his show they sold more than when they went on David Letterman‘s show but I am a die hard Letterman fan and will be one until I die and am just annoyed by the way they treated Conan O’Brien – go team Coco!). Bottom line advice to NBC: Promote Willie Geist and try not be douchie for 15 minutes. See how that works for you, you already know the opposite is a recipe for distaster. This entry was posted in Political thoughts, Random and tagged Anderson Cooper, Ann Curry, Katie Couric, Lauer, Matt Lauer, nbc, Today, willie geist on April 1, 2013 by Alyson Chadwick. Just when I thought I could not be any more of a grammar freak, I found I have a new pet peeve. Now, it seems that my hatred for inappropriate apostrophe usage is being challenged for my personal biggest peeve by upstart hatred for random capitalization. Do people just not understand the difference between a capital and lowercase letters? I can forgive a child but when I see veteran newspeople doing this (a local NBC reporter had a handmade sign at Dupont Circle that had all sorts of randomness) makes me CRAZY. And if you know me, you know the LAST thing I need in my life is that. Yes, I can do crazy all on my own. Anyone here have any new or really interesting pet peeves? This entry was posted in Comedy, Personal stories, The stories I tell and tagged Arts, Dupont Circle, grammar, nbc, Pet peeve, Style Guides, United States, Writers Resources on April 26, 2012 by Alyson Chadwick.